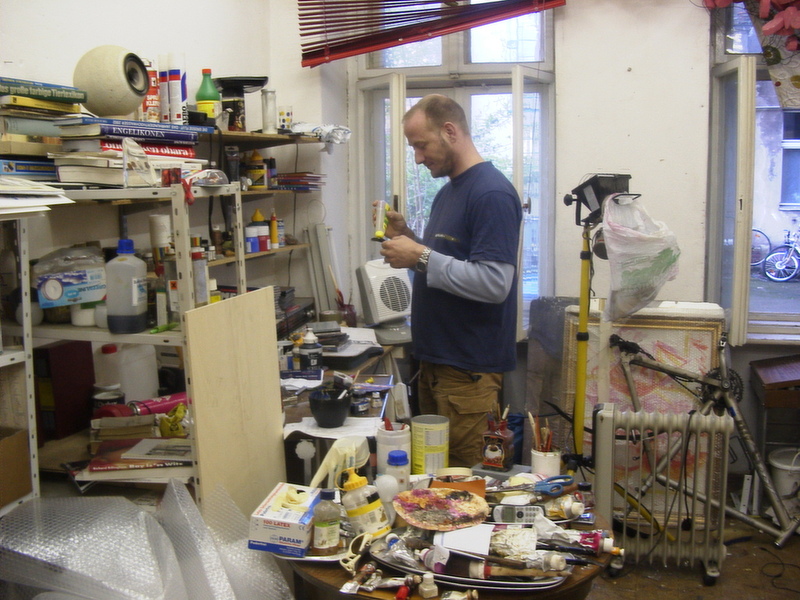 A dyed in the wool Berliner exhibits his highly eclectic works at PharoDercks Sprache & Kunst. His paintings and collages are diverse, surprising, and often satirical, ranging from cheeky to jaw-dropping. Stephan Kutsch grew up in East Berlin. In the late 80s, the GDR’s economy was in ruins and a growing number of citizens had no hope of bettering their situation. They would do anything to enter what they considered the ‘Golden West’. Stephan one of those who tried, only to be caught at the border. His attempt landed him in prison. He was among the last contingent of political prisoners ransomed freedom by West Germany, where he arrived in August 1989. A few months later, he would experience the fall of the Wall in Kiel. Like many in his generation, he took full advantage of his newfound freedom of movement by visiting the US, South America, and many West European countries. But his heart remained in Berlin. He was a mainstay at the wild clubs that popped up in the city in the 90s, such as E-Werk, Tresor, and 90Grad. Techno was a definitive influence and electronic music became his world. His first musical productions in the mid-90s were quite successful. But soon he found himself drawn more to the visuals arts, like painting and graphic design. His unforgettable work ‘Hands of Friendship’ welcomed the visitors of the legendary Ostgut nightbclub. Today he’s still lives in Berlin and is activ as an artist, musician, and, as he says about himself: “Die größte Künstlerin der bekannten Welt” (‘the greatest female artist in the known world’). He had his exhibition “Tales of Berlin” at our gallery November 27th 2015 through March 12th 2016.